This entry was posted on February 15, 2014 at 6:53 pm and is filed under Brand Loyalty, Marketing, Motivation. You can follow any responses to this entry through the RSS 2.0 feed. You can leave a response, or trackback from your own site. Love the blog. The sausage story puts me in mind of Yes Minister when Jim Hacker ascends to No 10 on his campaign to save the British sausage from the clutches of the EEC. They wanted to rename the great British sausage as the “emulsified high fat offal tubing”. Ha-ha. Try marketing that one!!! what a great show and what a great campaign that would be “offal”y good !! The key to retaining the “Sizzle” is front of house and attention to detail. Fergal Quinn visited all his stores daily as did P.V Doyle of Doyle Hotel fame ,you were not just buying sausages you were buying a piece of Fergal Quinns dream.Francis Brennan of Park Hotel Fame and “At Your Service” is also omniprescient in his business ie ALWAYS answers the phone and is in the front hall. Thanks Susan – it turns out the secret ingredient in the sausages was him all along ! Funny Greg just having a similar discussion with Ron during the week. Your post is spot on. Every book we read talks about this. Mission, passion, purpose, values. Why, why, why, why? It is the platform or framework for guiding principles, it is why you and your staff care, it is the reason you exist. If you can’t formulate this, do not go any further. This is right up your street Greg. “In research into the causes of corporate growth challenges, the author found that a lack of consensus among the management team (let alone the rest of the organisation) was the leading reason why companies fall off and can’t get back onto the growth curve. The larger the company, the greater the importance there is to get to a clear, simple brand idea. It needs to become a rallying point for the entire organisation. It shapes the culture, it shapes business decisions, and it shapes behaviours.” this is all straight from “The moment of clarity” or “The connected company”. You drove 20 minutes to do your shop because your were made to feel a little special you like the smells, the wines and the friendly atmosphere. What retailers can we say that of now? There is still a huge gap waiting for companies to step up to the plate. Changing the name isn’t one of them. Great point Dan – did they effectively get caught in the middle? They stopped being good at the things that made them special and at the time had nothing to compete with the value stores? I think its more a case they were synonymous as being a premium brand. It can be a real challenge to change peoples perceptions of a brand. The only option is to launch an entirely different brand (e.g. Toyotas Lexus brand. 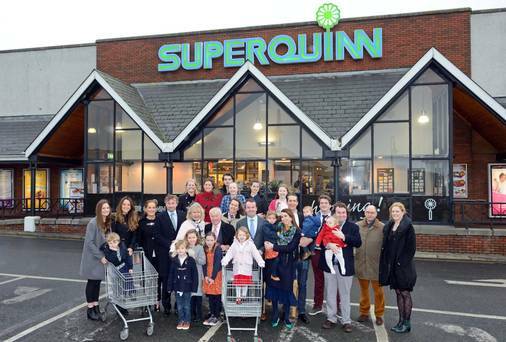 Dan – do you think SuperValu have done a good job with their handling of the brand takeover? 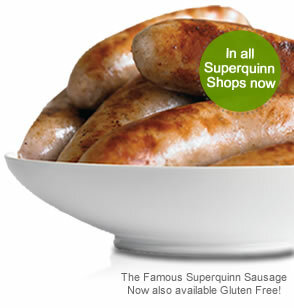 I see the Superquinn Sausage being heavily promoted in store these days at €4 per lb. I would suggest that price is a significant premium on other sausages. Add in the fact that they are now mass produced in a factory and the sizzle fizzles.